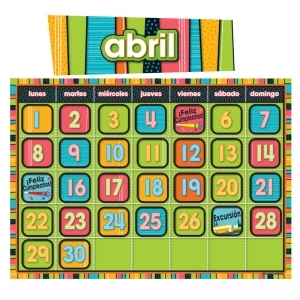 Stylin' Stripes Spanish Calendar Bulletin Board Set includes everything you need for a fun, colorful classroom calendar. 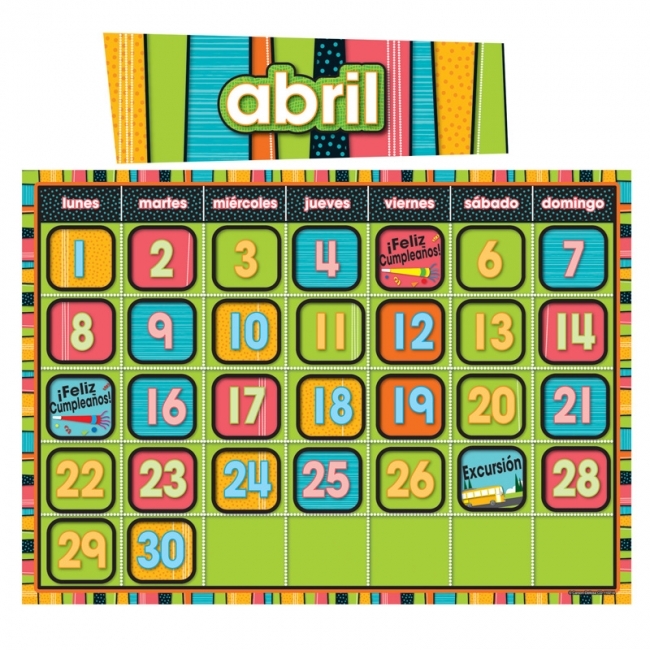 Set includes calendar, 12 monthly headers and 48 colorful calendar cover-up cards. 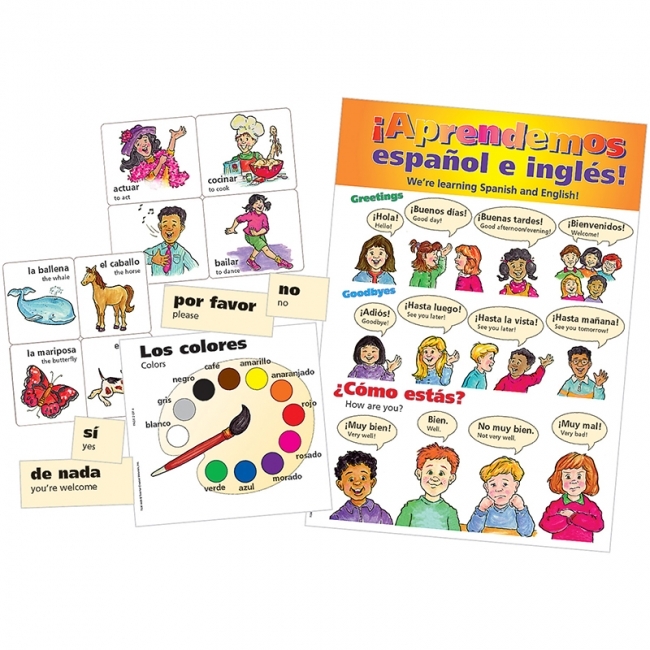 Perfect for helping students read around the room, this colorful foreign language bulletin board set helps to create a print-rich classroom environment. 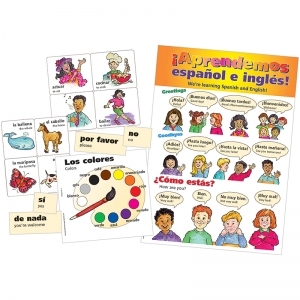 This set supports the Four-Blocks Literacy Model and includes 56 Spanish classroom label cards (sizes approximately 7" x 3.5" to 14.5" x 3.5") featuring matching illustrations and a resource guide. 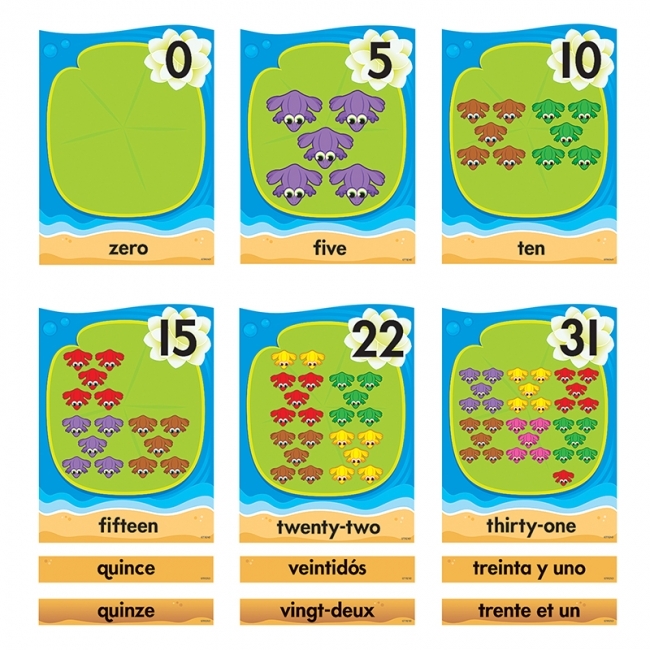 Colorful frogs in counting "chunks" teach numbers 0—31 and number words. 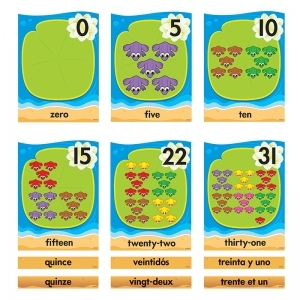 Additional number word cards in Spanish and French invite multilingual teaching options. 17 1/2' long. Stars and swirls brighten the day and help teach months, days, weeks, time concepts, weather, holidays, cultural events, celebrations, counting, addition, subtraction, graphing, planning, spelling, reading, and more! 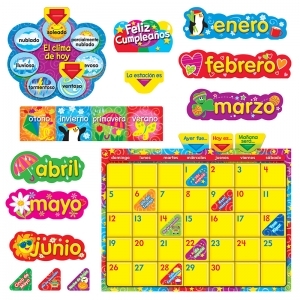 Includes: 23¼" x 17 1/2" Wipe-Off calendar, two sets of cling date markers, 12 month labels, 40 holiday and special day markers, seasons piece with sliding pointer, Wipe-Off birthday sign, weather sign with 2 pointers, and yesterday/today/tomorrow piece. 62 pieces plus cling. Pieces come in Spanish Language. Introduce students to numbers, colors, greetings, animals, common verbs, and more. All bulletin board pieces are UV coated for extra durability. A 4-page teacher resource guide is included.